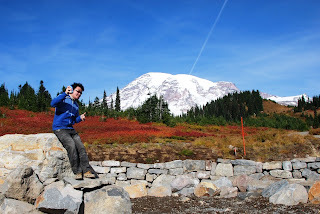 I just came from Mount Rainier National Park. It was beautiful! I will be posting more pictures soon! Hey, I like that photographic pose of yours against the stunning backdrop. Nice. Mukhang malamig ah. How cold did it get? I saw this photo in your facebook last night and wanted to comment that it's a very nice shot!!!! I miss those beautiful sceneries! the asian traveler - thanks! oic! it's mt rushmore! I heard of mt rainier! surely very nice from what I see here!! Superb photo. Mt Rainier is a truly inspiring mountain. Como esta? It seems like you're getting busy too. I just came back home to Hawaii. ANyway, I visited the Phils two weeks ago. Stayed there for 9 days, traveling from Banaue to Sagada to Baguio. Check out my latest adventure, yeah? I see you've been to Mount Rainier. Never been there yet, hope to experience same adventure you've had too! TC! very nice colors, jj!!! :D so brilliant. i am impress..... nice photos!! !